We all know how much of a comfort our cats can be in times of need. Having a purring ball of fur to snuggle up with can help anyone feel better. 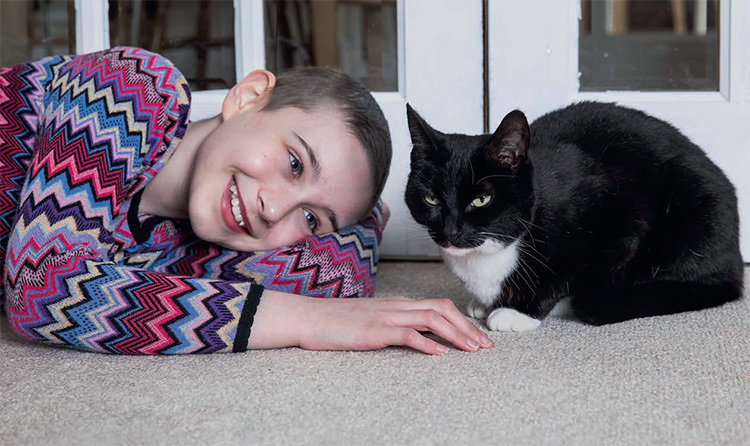 For 12-year-old Evie Henderson, from North After being diagnosed with cancer, comfort came to young Evie in an unlikely, furry package, writes Rachel Armitage. Genie has supported Evie through her illness. Hykeham, Lincolnshire, her cat has truly been her rock. Black and white moggy Genie had a tough start to life — she was a rescue cat from Wood Green, The Animals Charity, in Godmanchester, Cambridgeshire, rehomed by Evie’s family when she was year old. Genie is described by Tina and Evie as having been a bit grumpy when she first came home. She was more of an outdoor cat and was a bit reluctant to have cuddles, but she took to Evie more than anyone else. Evie was diagnosed in March 2016, after she complained of leg pain following a friend’s party. It was initially thought that she had shin splints from dancing on the hard floor, but the pain didn’t go away. After going back and forth to the doctor’s, Tina asked for an X-ray to be carried out. The X-ray found that Evie had an aggressive form of bone cancer. She underwent six gruelling rounds of chemotherapy and several painful operations, as well as lengthy hospital stays far away from home in Nottingham and Birmingham. Throughout it all, it was Genie who helped her cope. Evie would tell her doctors all about Genie, and as she couldn’t have many visitors due to her low immune system, she became quite lonely and relied on Genie for companionship. “She’s been absolutely amazing while I’ve been poorly,” says Evie. “Even before I was diagnosed, she’d come and rub herself around my right leg. I think she knew there was something wrong. Even when Evie was in hospital in Nottingham, Genie would look out for her. Tina says when they pulled up on the drive, Genie would come running to see if Evie was in the car. If she was, Genie would follow her into the house; if not, she’d just run off again. “Cats just know when something is wrong. They say dogs are in tune with these things but I didn’t expect a cat to be,” says Tina. Evie had her final treatment in June 2017 and is now in remission. She has bi-monthly X-rays to make sure the cancer doesn’t return, but Tina says she’s looking very well her walking, and she uses a wheelchair or crutches when she gets tired. Evie spotted an appeal for applications for Cats Protection’s National Cat Awards, and suggested to Tina they should nominate Genie. They entered her into the Outstanding Rescue Cat category, which commemorates cats who have been adopted. Genie went on to win the title, as well as the overall prize of Cat of the Year at the awards ceremony at The Savoy Hotel in London. A celebrity judging panel — made up of writer, broadcaster, and journalist Andrew Collins; actress Anita Dobson; actor Paul Copley; Olympic clay pigeon shooter Charlotte Hollands; The Vamps musician James McVey; actor Anthony Head; animal therapist Sarah Fisher; task of choosing the winners. Evie and Genie’s story even inspired last year’s (2018) Cats Protection Christmas advert: Genie’s Christmas Wish.